Last Sunday Curtis and I went out to eat. We were reading our table tent advertisement, it said: Por la PAZ, de que soy, caPAZ? (For peace, what am I able to do?). It struck me as an odd table tent advertisement for a pizza place, but it also reminded me that we are living in a country with a 50 plus year ongoing armed conflict. Promising peace talks have been under way since 2012 between the government of Colombia and the FARC (Revolutionary Armed Forces of Colombia) (they have agreed to 4 of the 6 points). While the peace talks are important for the future of peace here, the signed document is not what will bring peace. So, back to the table tent. I noticed it, ate my pizza, and left. A few days later I noticed another sign somewhere (remember I am still learning Spanish) that said something about I am able…for my country (I missed the middle part). Then a few days later I noticed a woman carrying a shopping bag that said ‘for my future, for my family, and for my country: I am able’. I figured there must be something going on. Then my suspicions were confirmed in church yesterday. The pastor talked about ‘Soy Capaz’ (I am able). 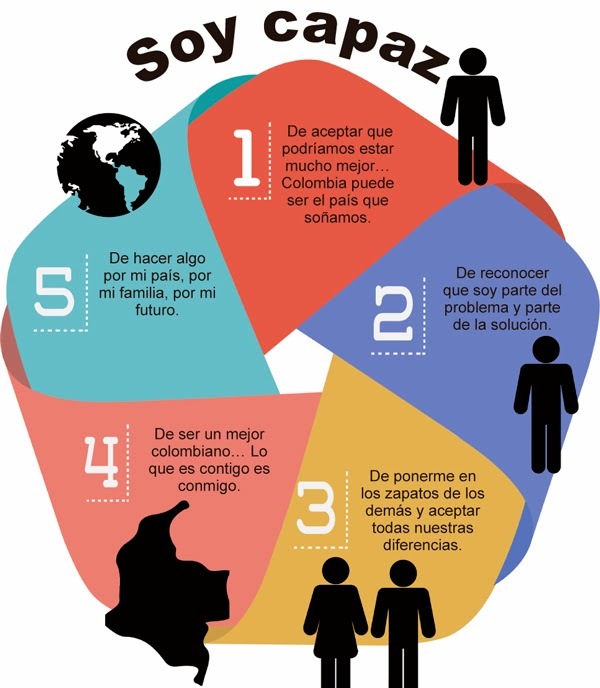 Turns out there was a national campaign launched last week to encourage everyone in Colombia to think about the role we all play in promoting and building peace. The campaign will last for 30 days and consists of five points: 1) I am able to accept that we can be much better; Colombia can be the country we dream of. 2) I am able to recognize that I am part of the problem and part of the solution. 3) I am able to put myself in the shoes of others, and to accept our differences. 4) I am able to be a better Colombian. 5) I am able to do something for my country, for my family, for my future. I think this campaign is good for a number of reasons. This campaign acknowledges that this country isn’t at peace right now. People who live in Bogota (myself included) have the luxury of ignoring what’s happening in other places of the country. This campaign also asks every individual to think about what he/she can do to build peace. So it leaves me with these questions: What am I able to do? As a foreigner? As an American? As a Christian? How does this affect my work with youth and women?